Jonathan Regosin of the Division of Fisheries and Wildlife speaks before a crowd about coyote hunting. 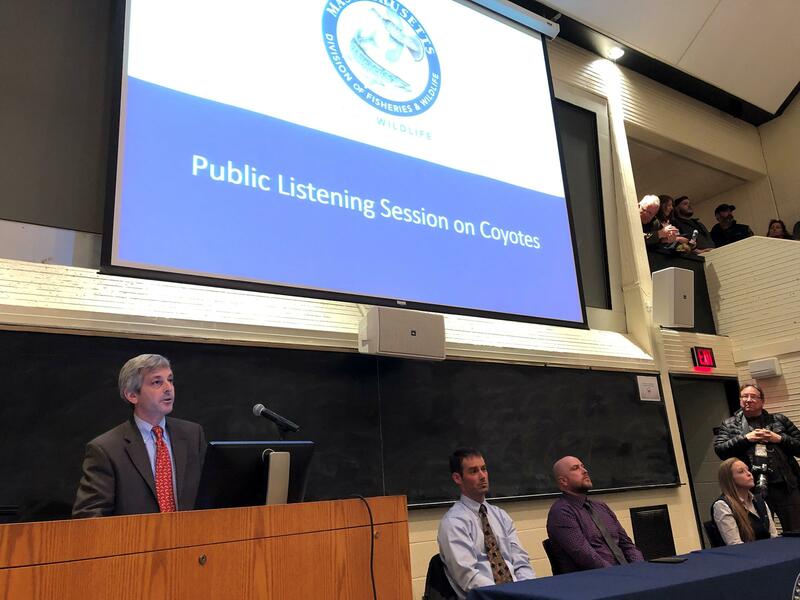 Animal rights activists and environmentalists called on the state’s Division of Fisheries and Wildlife to stop coyote-hunting contests at a standing-room-only meeting in Barnstable last night. The state's annual coyote hunt happens from October to March in Massachusetts. The hunt has been particularly controversial for Cape Cod residents, where a Hyannis gun store's coyote hunt contest has angered animal rights activists. Coyote hunting has been legal in the state since 1982, and officials said that Massachusetts has one of the strictest coyote hunting regulations in the country, and is one of only four states that does not have year-round coyote hunting. Nonetheless, many environmentalists felt that coyote hunting was not in keeping with the spirit of the Cape. "Coyote killing contests are a blight on our community. We Cape Codders love our wildlife. You can pick up a Cape newspaper any day of the week and read a newspiece on whales, or sharks, piping plovers, or even coyotes," resident Jan Rafaeli said. Others also asked that the state create more regulations around catch limits on the animal, and also on how the animal is used once it's been killed. There were few hunters in attendance, but one, who asked to only be identified as Matt for fear of repercussions, said he likes hunting coyotes, and thought it'd be unfair for the state to take that away. "It’s challenging, it’s population control, it's got a beautiful pelt, beautiful fur. And it’s just enjoyable," he said. "There’s a lot more coyotes on Cape Cod than they think." The division estimates there are 650 to 900 coyotes on the Cape, and of that, around a hundred are killed during the hunting season each year. The Division stated that it would be hearing concerns in order to shape future regulations around coyote hunting. Another listening session will be held on June 18.